The recent release of an AHRQ (Agency for Healthcare Research and Quality) report on the off-label use of atypical antipsychotics has raised some eyebrows among advocates for the least medicating approach to dementia care. The report seems to provide evidence in support of using Abilify, Risperdal, and Zyprexa (atypical antipsychotics all) to “treat” behavioral symptoms of dementia. Upon closer examination, however, the report reinforces the notion that antipsychotics have woefully limited efficacy and are rarely clinically justified in dementia care. Most of the studies reviewed by AHRQ were paid for by the drug manufacturers. All but two studies lasted twelve weeks or less which means long-term effects were hardly considered. Major studies that have shown antipsychotics are inferior to placebos were not included, including the DART-AD and CATIE-AD studies. The idea that antipsychotics successfully diminish observable psychosis, mood swings, and aggression is hardly news. That’s what makes them successful as chemical restraints and often the treatment of choice for stressed-out, overworked caregivers. When it comes to sedating and subduing someone, antipsychotics have efficacy. But as the AHRQ itself admits: there is no assessment of net efficacy. In other words, the costs at which the small benefits of antipsychotics are obtained were not considered in the AHRQ assessment. Nonetheless, the AHRQ does re-state some of the familiar costs: strokes, Parkinsonian tremors, sedation, fatigue, and increased death. Obviously, these grave risks counter any benefits of using antipsychotics. Even if antipsychotics were not accompanied by fatal side effects and clearly had the ability to reduce behavioral problems associated with dementia, their propriety would remain doubtful. Antipsychotics do not “treat” dementia in any way. 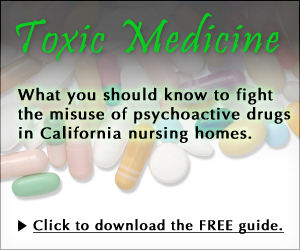 Rather than resolving the root cause of the problematic behavior – the pain, the fear, or the confusion that are prevalent in dementia care settings – antipsychotics mask them. A person with dementia who acts out is conveying discomfort of some kind. Sedating and subduing the person so they can no longer express discomfort removes their one method for communicating problems. Thus, the root cause persists – only now the poor victim is unable to have it identified and resolved. Compounding the tragedy of chemical restraints is the existence of myriad cheap and effective non-pharmacological therapies that not only comfort persons with dementia but are aimed at resolving the underlying cause of their behavior. Studies show that “comfort-centered care” focused on a person’s environment and perception are superior to drugs for allaying agitation and behavioral problems. And, they come without the fatal side effects. Despite the AHRQ’s conclusion that antipsychotics have efficacy in dementia care, the benefits seem to be limited to their sedative side effects and not to any resolution of distress or discomfort. When deadly side effects and the abundance of superior alternatives are considered, it is clear that antipsychotics should remain the absolute last resort for addressing behavioral problems associated with dementia. Nothing in the AHRQ report suggests otherwise. Anthony Chicotel is a staff attorney for CANHR. His areas of expertise include the rights of long-term care residents, nursing home litigation, health care decision-making, and conservatorships. Responses to CANHR blog postings do not reflect the opinions of CANHR or its staff members. Learn how to file a complaint against a nursing home and against doctors. Review legal options and connect to our Lawyer Referral Service. Click here to get started. Please mail comments to web manager. Web design and development by Design Engine.